Happy Monday! I hope you all had a wonderful weekend! I had a really nice weekend spending time as a family and enjoying a date night. My husband and I split babysitting responsibilities with our friends. We watch their kiddos so they could go on an afternoon date and then we traded off so we could on an evening date. We went to our favorite fancy burger place and enjoyed delicious dessert at one of my favorite bakeries. Babysitting each other's kids is definitely a win-win! Free childcare and a date with your spouse. I also got my baby fix and I love squishy babies! 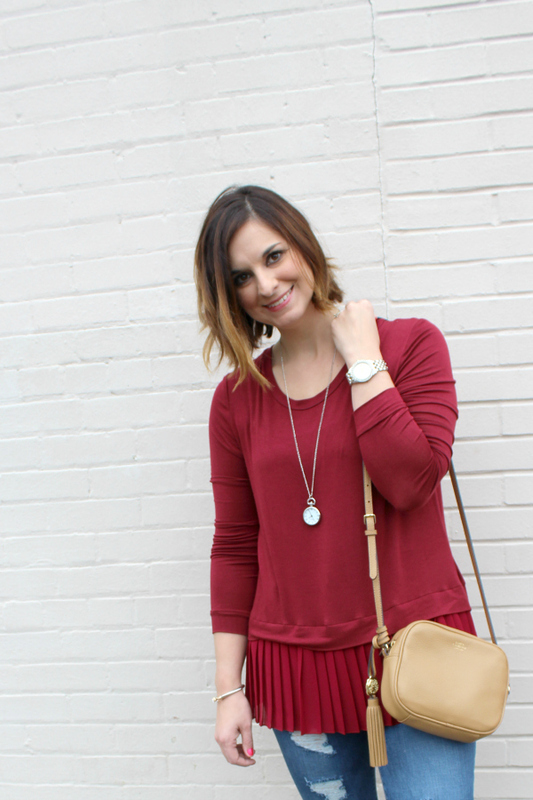 Today, I'm styling another comfy casual piece from Gray Monroe! 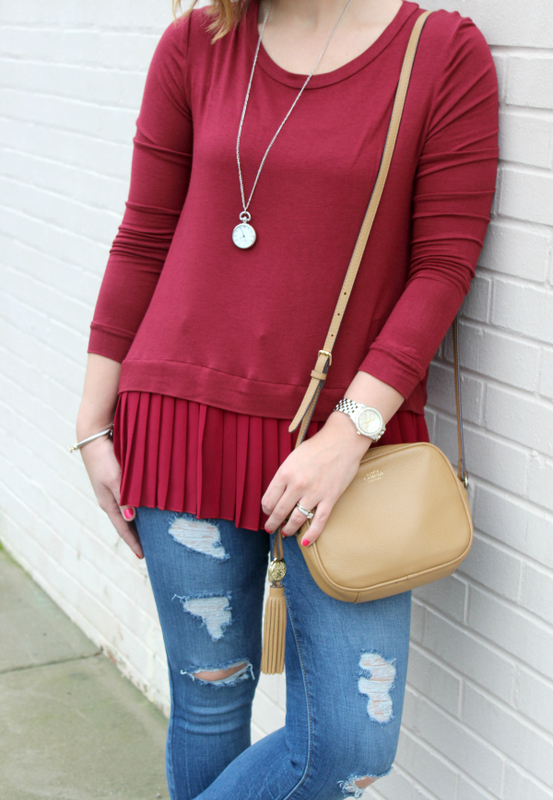 I love the pleated peplum style of this top and the gorgeous burgundy color. Also, how fun is the back of this top?! It kind of looks like a whole different top from the back view. For size reference, I'm wearing a size medium in this top for a looser, more relaxed fit. It also comes in a gorgeous oatmeal color that I love too! 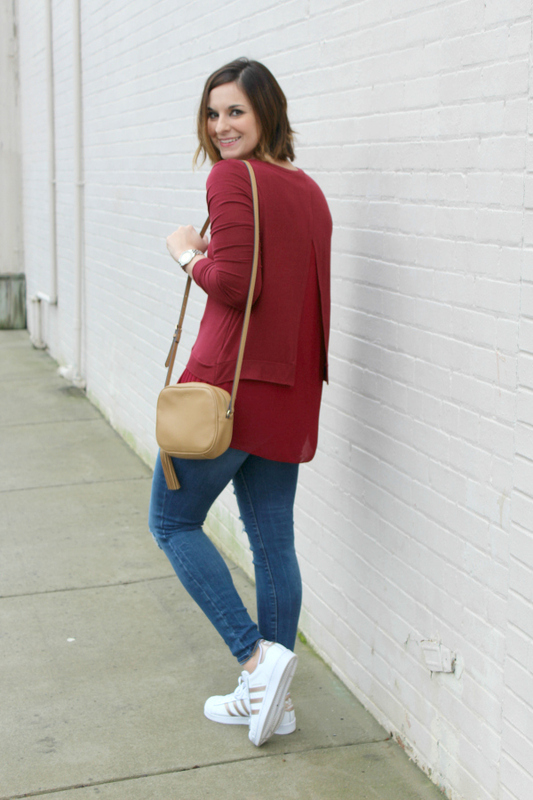 I paired the Macy Top with distressed denim, my new shoes, a neutral tan bag, and simple accessories. 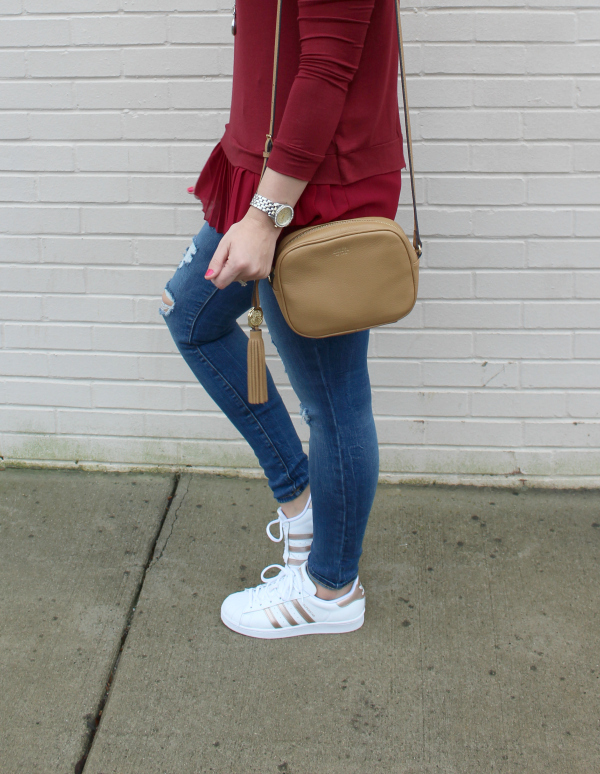 This look would be perfect for running weekend errands because it's so comfortable! Give me all of the comfy clothes! P.S. You have the chance to win a box of jewelry from mintMONGOOSE, including my watch necklace on my Instagram account today! Have a great week, y'all! 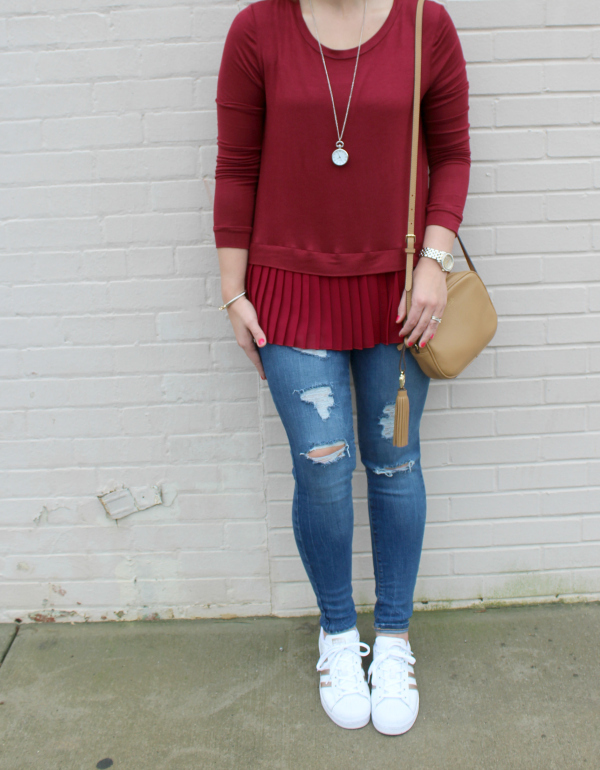 I love this pleated top! Such a pretty color on you! absolutely love this top! need it in my life!! That peplum top is sooo cute, I haven't seen one like it! Not only are those pleats super cute, but the back too! Love the feminine top with the adidas. Those are my favorite. What a cute look! Adorable top! I love how you've paired sneakers with this outfit. Cute & Casual. The gold pops on the shoes are my favorite!